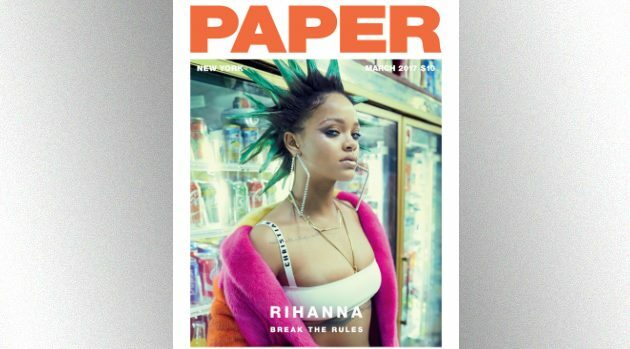 Courtesy of PAPER Magazine / Photography by Sebastian FaenaRihanna has taken her bad gal vibes to another level on the cover of Paper‘s March issue. The superstar can be seen in a convenience store sporting green, spiky locks topped with big diamond-encrusted earrings, an eyebrow ring and a multi-colored fur coat to complete her punk rock look. Within the pages of Rihanna’s #BreakTheRules cover shoot, the singer trades her green hair for other colors, including purple and orange, both styled in a long, flowing ponytail. The last time RiRi graced the cover of Paper was in 2007, to coincide with the release of her third smash hit album, Good Girl Gone Bad. You can pick up a copy of Paper‘s latest issue on newsstands March 6.